This organization, working with the hungarian 'water wizard' Pal Pauer, has drilled over 80 boreholes to primary water at various depths, in Tanzania, installing handpumps that enable villagers to have easy access to clean water that is free of disease causing microbes, parasites, and surface contaminants. Before these wells delivered primary water to their villages women, and girls, were forced to walk miles in search of water that was too often unfit to drink, carrying containers of water on their heads. Sometimes women or girls were seized, and killed by crocodiles at the river banks as they filled containers with water, or they were attacked by rebels or bandits. Now there is safety and clean water for these villagers, thanks to the work of the GRA. "Since antiquity, the source of water generated deep within the Earth, clearly defying the conventional scientific hydrologic cycle explanation, has been a mystery. How does one explain sources of water throughout the world that produce impressive quantities of fresh water, often in dry areas with little rainfall or at high altitudes? 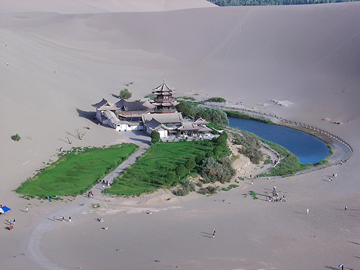 Besides numerous oases in Sahara, Arabic Peninsula, Middle East and the driest deserts elsewhere, and countless springs at mountain tops worldwide, there are clear examples of this phenomenon which stand out, like the Ain Figeh spring near Damascus, the Montezuma Well in the Sonora Desert in Arizona or the Zamzam well in Mecca." "It seems that ancient civilizations had a profound understanding of this phenomenon, and morever a method of accurate locating of invisible underground water veins and streams. Without heavy drilling and excavating equipment, they have built impressive water supply systems all around the world. More than 5,000 years ago, ancient Persians developed the system of Qanats, which eventually spread around the region, and up to North Africa." "The water wells of Gibeon and Beersheba, and huge cisterns of Masada in what is now Israel, are a total puzzle to modern hydrologists." "Juvenile Water -- original water, formed as a result of magmatic processes. Juvenile water has never been in the atmosphere. Magmatic water can form in very large quantities. A magma body with a density of 2.5, an assumed water content of 5% by weight, a thickness of 1 kilometer, and an area of 10 square kilometers contains some 1.25 x 10 to the 9th power cubic meters of water." http://oxfordindex.oup.com -- "A Dictionary of Earth Sciences"
---- Tokyo Institute of Technology, Tohuku University --- Associate Professor Motohiko Murakami, was awarded the 2013 James B. Macelwane Medal at the Fall Meeting of the American Geophysical Union for his outstanding research on the inner structure of the Earth. 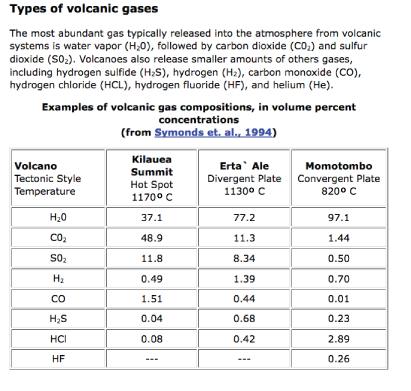 Professor Murakami headed the team that made their calculations on the volume of water within the mantle, based on their lab studies of the structure of the Earth. Professor Kei Hirose, Hirose Laboratory, Department of Earth and Planetary Sciences, Institute of Technology, Tokyo, specializes in high pressure mineral physics and petrology, and led research group, assisted by Associate Professor Murakami. Hirose was originally interested in the generation of basaltic magmas and conducted experiments using piston-cylinder apparatus on partial melting of peridotites in the upper-most mantle. Note: The above text provides a bit of contemporary research done to confirm presence of water within the Earth's mantle region. "The Water Cycle describes the existence and movement of water on, in, and above the Earth. Where does all the Earth's water come from? Primordial Earth was an incandescent globe made from magma, but all magmas contain water. 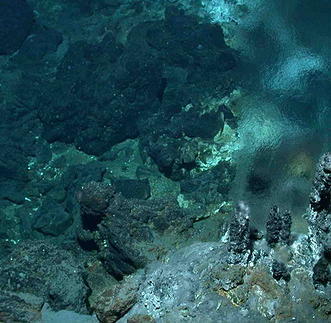 Water set free by magma began to cool down the Earth's atmosphere, until it could stay on the surface as a liquid. Volcanic activity kept and still keeps introducing water in the atmosphere, thus increasing the surface and ground water volume of the Earth." "Water is constantly traded back and forth between the ocean and the rocky mantle because of plate tectonics," the researchers said. "Super Earths are expected to have deep oceans that will overflow their basins and inundate the entire surface, but we show this logic to be flawed," said Nicolas Cowan, at Northwestern University in Illinois. "Terrestrial planets have significant amounts of water in their interior. Super Earths are likely to have shallow oceans to go along with their shallow ocean basins. Scientists suggest that tectonically active Super Earths store most of their water in the mantle - the rocky part that makes up most of the volume and mass of the planet." "The Fertile Crescent, which stretches from Israel to the Persian Gulf and includes the Tigris and Euphrates rivers in Iraq, is supplied at its easternmost point by a cave in an iron-red limestone cliff. This flow becomes the Jordan River. At its westernmost point are springs. One flows from the foot of a buttress on Mt. Hermon and another pours from the cliffs in waterfalls. A spring in Oregon flows at 690 million gallons a day, a spring in Missouri flows at 800 million gallons a day, and a series of springs along the Snake River in Idaho flow at 3.5 billion gallons a day." "In France, Professor C. Louis Kervran wrote an essay in 1977 on the origin of water in crystalline rock. He knew that most of the wells in his native Brittany were found by dowsers and dug into solid granite. In his career he knew of so many cases where tunneling into rock created floods that wiped out the construction sites that he didn't bother to collect data on them. During a drought in 1976 the French Geological and Mining Bureau loaned drilling equipment to find water in the region. Successful wells were drilled into crystalline and metamorphic terrain." "In the 1950's, flooding impeded construction of the Tecolote Tunnel through the Santa Ynez Mountains. 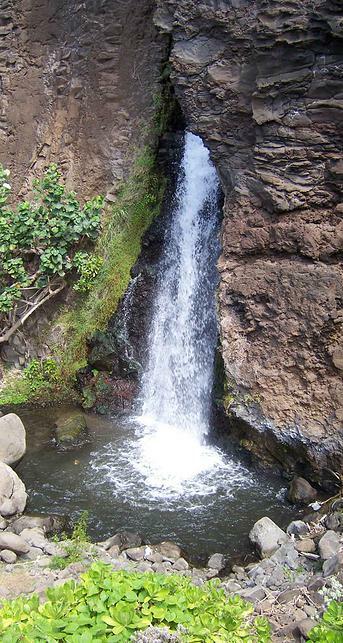 By its composition and the depth at which it was encountered, the thirteen million gallons a day was not rainwater. 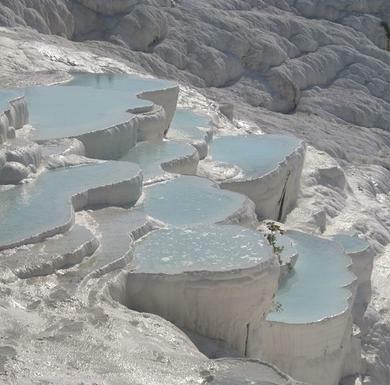 Some of the water was hot, as much as 117 degrees Fahrenheit, and mineralized, some was cool and exceedingly pure. The flows were stopped so construction of the six-mile long tunnel to connect Santa Barbara to the Cachuma Reservoir could continue." 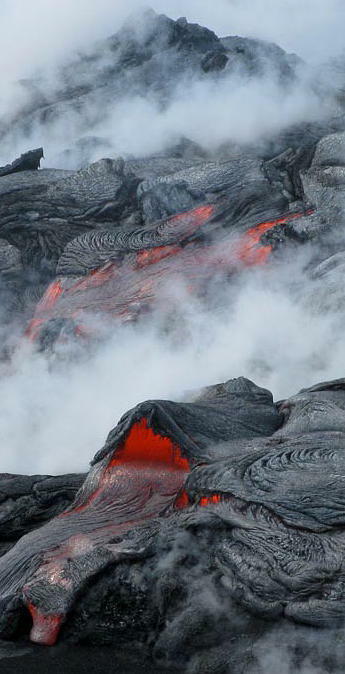 "Hypothesis of Leaching by Hot Springs of Magmatic Origin ------- When lava cools at the surface, great quantities of the expelled waters pass off as clouds of steam. As the crust slowly hardens, and the congealing magma becomes further away from the surface, the escaping waters will become cooler in their passage upward. A stage will finally be reached when they will not entirely be vaporous on emerging at the surface, but will become liquid. They will, in fact, emerge as hot springs, and it is probable that the change from steam jets (fumaroles) to hot springs is the normal process of cooling volcanoes. The water which is given off at the contact of an intrusive mass of igneous rock, and which is frequently so active in producing rock changes or metamorphism, must also exist after it has accomplished these changes. We may suppose that if there are any channels, such as are afforded by fissures or faults, this water may find its way upward, and perhaps even reach the surface. Springs having this origin may be called (following Professor Suess of Vienna) juvenile springs, the term referring to the recent birth of the water from the magma. 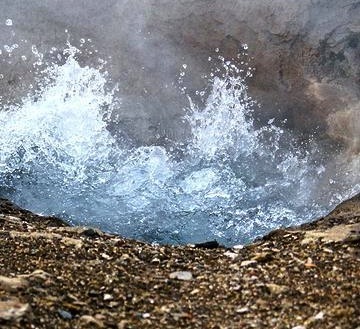 The recognition of the above for many hot springs led many geologists to assume that it was these juvenile hot waters (not heated atmospheric waters) which had been powerful in searching the solidified igneous rocks (and the intruded rocks as well) and dissolving out the metals. On examination, the rocks on the margins of instrusions in many cases show profound alteration, such as would be the work of expelled magmatic waters."